While being evicted from her Milwaukee apartment, Danielle Shaw (left) and relatives wait until the movers carrying down her refrigerator and stove are no longer blocking the stairwell. 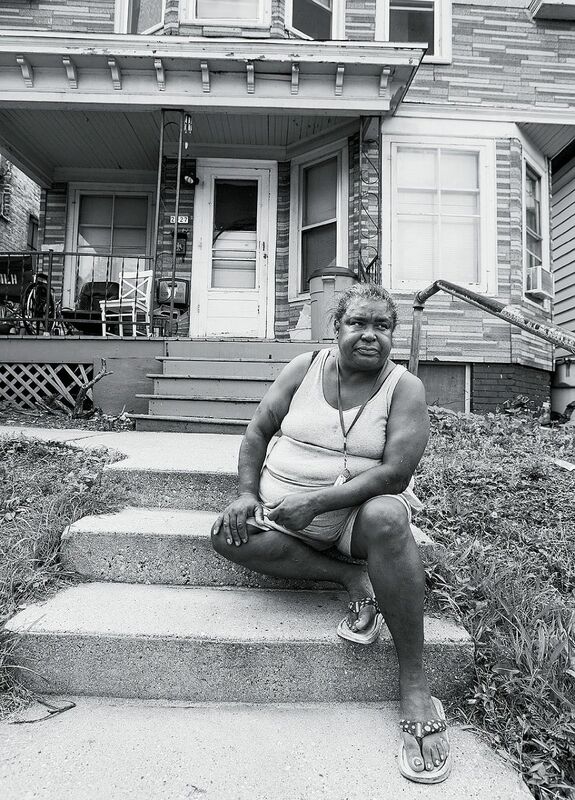 Yolanda Matte, Danielle Shaw’s grandmother, was among those evicted that day. 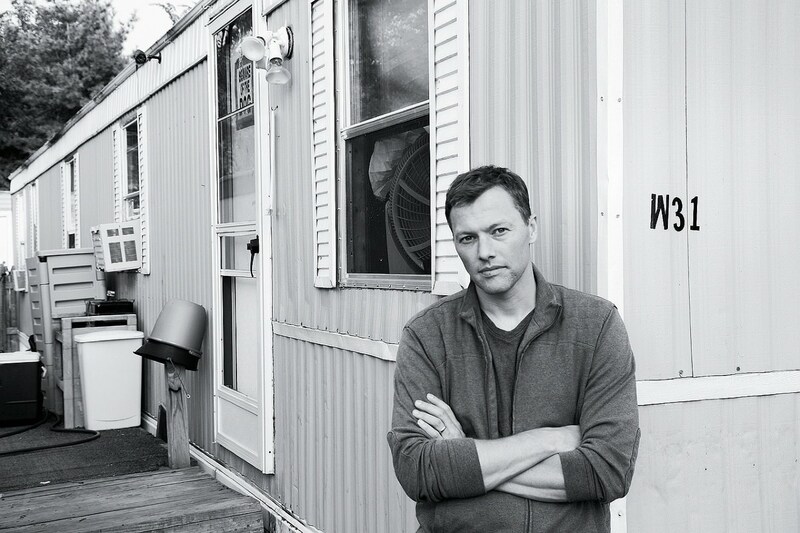 Matthew Desmond at the Milwaukee trailer park where he lived while conducting fieldwork for his doctoral dissertation. 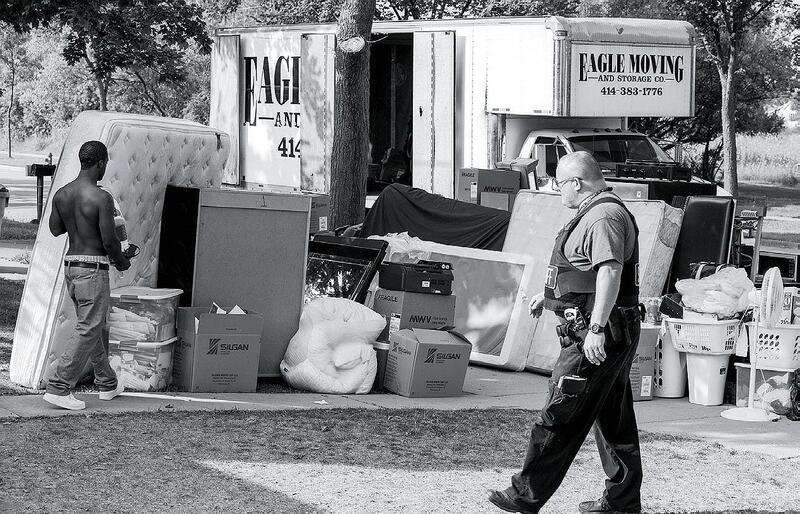 A deputy sheriff supervises as an evicted tenant carries belongings to the curb. 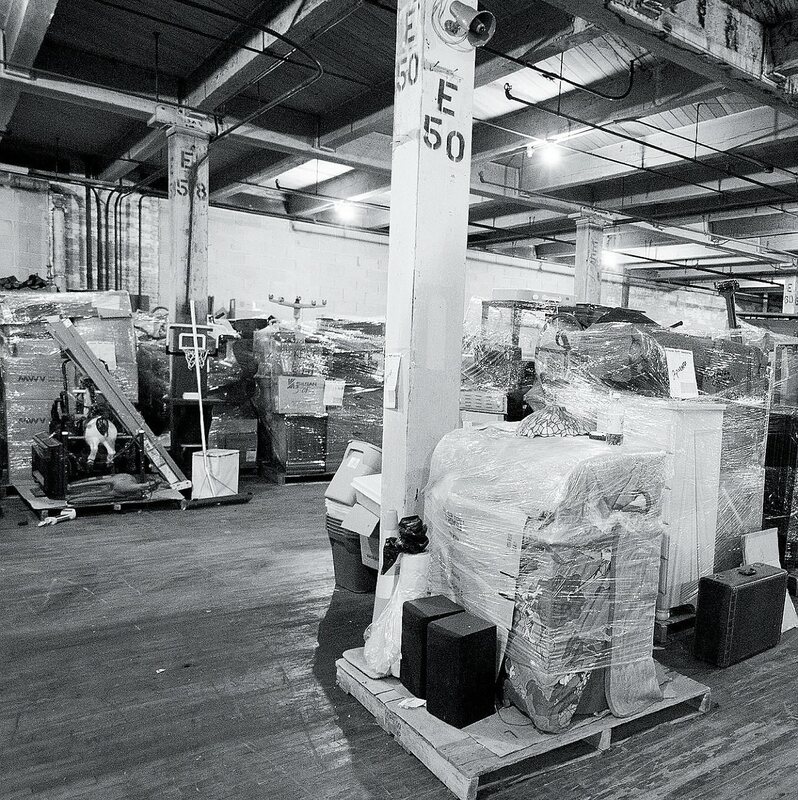 The Milwaukee warehouse of Eagle Moving and Storage Company, where evicted renters can pay to store their belongings. Katherine Faulkner was evicted from her apartment after missing a court date while she was in the hospital recovering from a stroke. Desmond catches up with Kendall Belle (known as “Woo”). The two were roommates while Desmond did his fieldwork. After phoning a friend to ask for storage space at his house until they found a place to live, Allen left to rent a trailer. In their bedroom, Shaw made phone calls to friends and relatives, explaining that they were being forced out earlier than expected. “I don’t see how they get to just put our stuff out,” she told one. “We have nowhere to go.” After hanging up, she sat down on the bed, her expression heavy with despair. Desmond’s research has revealed just how common eviction is in the lives of poor people, particularly for residents of the segregated inner city. Analyzing court records of formal evictions, he found that in Milwaukee’s majority-black neighborhoods, 1 in 14 renting households is evicted each year—and even this proportion significantly underestimates the number of families whose lives are disrupted by involuntary displacement. That’s because formal evictions can be expensive for landlords—in addition to lawyers’ fees, they must pay court costs and an hourly charge for the eviction squad—so they often work out agreements with tenants, sometimes even paying them cash to move out. Desmond also met landlords who used more adversarial means, cutting off electricity or even removing the front door of a tenant in arrears so that the unit would be condemned and the tenant forced to move out. These sorts of forced relocations take place off the books. So Desmond collected new survey data from more than a thousand Milwaukee renters to try and capture all involuntary displacements and gain a more comprehensive picture. Working with sociology graduate student Tracey Shollenberger, he found that the most recent move for almost one in eight Milwaukee renters was an eviction or other involuntary relocation; the ratio rises to one in seven for black renters, and fully one in four for Hispanic renters. He believes the acute lack of affordable housing in American cities—the worst such crisis, he says, since the end of World War II—is the primary reason low-income families are being evicted at such high rates. When the real-estate bubble burst, sale prices for homes may have fallen, but rents did not decrease correspondingly. During the last 16 years, median rent nationwide has increased more than 70 percent, after adjusting for inflation. As poor people watched their rent shoot up, incomes remained stagnant: in Milwaukee, for instance, the fair market rent for a two-bedroom apartment in 1997 was $585. By 2008, it had risen to $795—while monthly welfare payments did not rise at all, and minimum wage increases have not kept pace with inflation. As a doctoral student in sociology at the University of Wisconsin-Madison, Desmond was initially drawn to study eviction because of its relational quality: “It brings together poor and nonpoor people—tenants, their families, landlords, social workers, lawyers, judges, sheriffs—in relationships of mutual dependence and struggle,” he explains. The moment of eviction also offers insight into low-income families’ survival strategies and social networks, and into the dynamics of the low-income housing market. Only after beginning his research did Desmond realize how socially significant—and how little studied—eviction was. No national data exist; he constructed the Milwaukee data himself by examining tens of thousands of Milwaukee County eviction records. In the Milwaukee Eviction Court Study, Desmond interviewed 250 tenants who appeared in eviction court. His Milwaukee Area Renters Study, funded by the MacArthur Foundation, involved in-person interviews with members of more than 1,000 households; the questions covered residential history, employment, material hardship, landlord interactions, and social networks, among other topics. Desmond’s fellow sociologists say they appreciate the way he reframes problems and challenges paradigms, instead of simply studying questions identified by others as important. In his Milwaukee fieldwork, he has observed several patterns that led him to identify new problems. For example, he discovered that the presence of children is not a mitigating factor when it comes to eviction: even after controlling for household income and the amount owed to the landlord, tenants with children are more likely to be evicted. His observations also suggest that the family no longer serves as a reliable source of support for today’s poor, contrary to the long-standing assumption of social scientists and policymakers that destitute families depend on extended kin networks to get by. In a 2012 journal article, Desmond presented a new explanation for urban survival, emphasizing what he calls “disposable ties” formed between strangers. To meet pressing needs, people tended to form intense relationships with new acquaintances—with much sharing of personal confidences, companionship, and resources—that nevertheless frayed or broke off after a short duration. This new category of “disposable ties” thus possessed attributes of both the “strong ties” (intense relationships, usually referring to family or close, long-lasting friendships) and the “weak ties” (acquaintances, distant relatives, or co-workers) of the traditional sociological framework. Desmond’s eviction study also identified a worrisome effect of “third-party policing,” the practice of shifting the law-enforcement burden to private parties, such as landlords. Working with Columbia University sociology graduate student Nicol Valdez, he studied one form of such policing: “nuisance ordinances” that sanction landlords with fines, license revocation, or even jail time if the number of 911 calls made from their property is deemed excessive. Because landlords often “abate the nuisance” by evicting the tenant who placed the calls, these ordinances force domestic-violence victims to choose between their immediate physical safety and keeping their apartments. After he published a paper on this topic, the American Civil Liberties Union, working with a Pennsylvania woman evicted after being attacked more than once by her boyfriend, filed a lawsuit (now pending) challenging the legality of such ordinances. 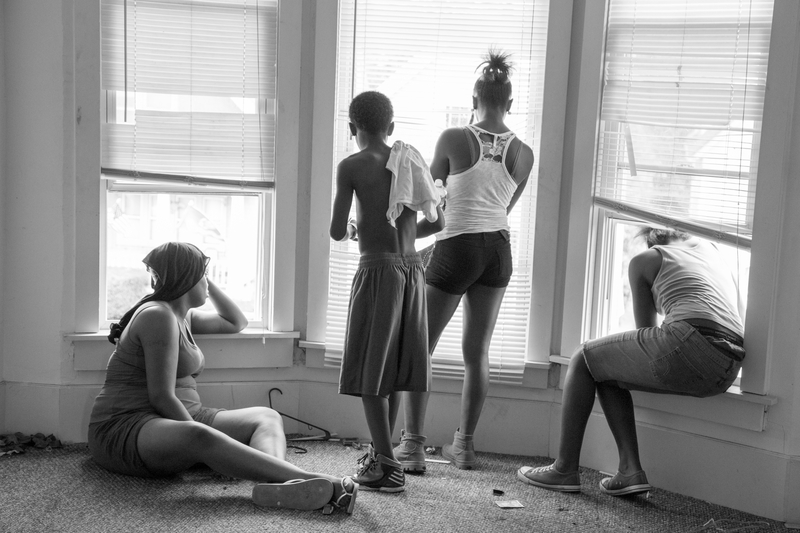 This intimate view of life in poor neighborhoods informed the way Desmond designed his surveys. It also allowed him to study eviction at the ground level: observing, for instance, which tenants landlords work with and which they throw out. On several occasions, he saw one tenant being evicted while another owing the same amount (or even more) was granted extra time to pay or the chance to work out a special arrangement with the landlord. The eviction decision, he learned, cannot be reduced to simple arithmetic involving how much someone owes; tenants’ gender, race, family status, and style of interacting with the landlord also come into play. 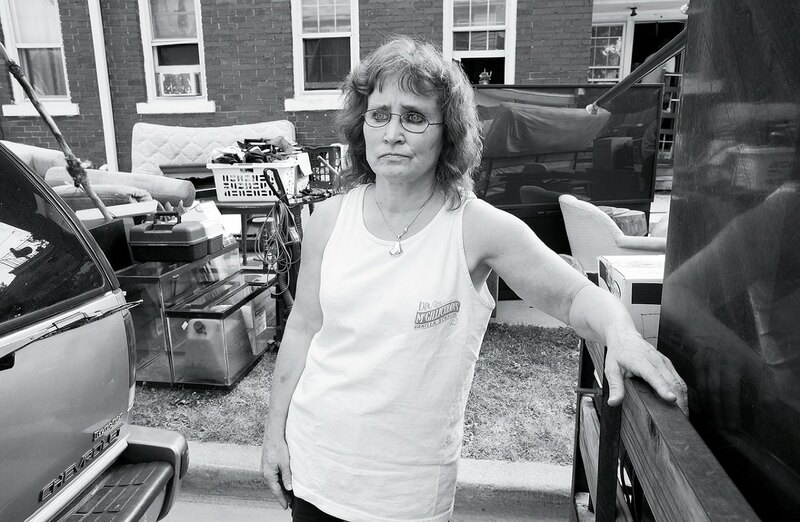 On that Wednesday in August, confusion was the common thread among the three households that were evicted. (Six others had either moved out already or been granted more time). In one case, a woman who worked two jobs (as a school-bus driver and manager at McDonald’s) said she paid her rent on time but the checks were returned to her uncashed after the bank foreclosed on her landlord. She was forced to leave with her two children—including a two-month-old baby. In another, an eviction order was issued when a hospitalized tenant missed a court date because she was recovering from a stroke. She had even been to court the day before the eviction actually occurred, and had been misinformed by her landlord’s attorney that the situation was resolved and that she would be allowed to stay. Danielle Shaw and Jerry Allen also felt misled. The previous December, before moving in, they had told their landlord that their “money situation was going to be up and down,” reflecting their job situations. Both Shaw, 21, and Allen, 20, had occasional employment (she with a temp agency, he with a building-demolition crew), but were looking for steadier work. Shaw said the landlord told her when she signed the lease, “It doesn’t matter if the rent is late—just pay the late fee.” But when they did fall behind, he initiated eviction proceedings. Desmond has seen dozens of cases where tenants don’t know their rights, don’t understand the process, and are given conflicting or inaccurate information. In eviction proceedings, most landlords have legal representation, while most tenants do not. For this reason, he advocates increasing access to free legal counsel for tenants. Very often, his policy suggestions are grounded in trends turned up by his ethnographic research. After observing case after case in which a relatively small unplanned expense led to a missed rent payment and, ultimately, eviction, he also supports the idea of one-time grants for families experiencing temporary financial hardship. (He writes, for example, of one woman evicted from the trailer park who fell behind in her rent after paying her gas bill because she wanted to be able to take hot showers.) With examples like this, he aims to show that every day, poor people are forced to make choices among items that middle-class Americans take for granted, and sometimes must even choose between basic needs, because they can’t afford them all in the same month. Through his books, articles, and newspaper op-ed essays, he tries to get readers to reexamine how they think about poverty and issues of race. One important point he stresses is that poverty is not innate or permanent, but rather, is influenced by social structures and relationships, such as that between landlord and tenant. “A lot of people talk about poverty like it’s a permanent state of being,” he says, “like the poor are a plant variety.” Instead, he says, poverty is a process that involves a victim, a system that produces poverty, and people who benefit from that system—and he challenges each of us to recognize our role. By all accounts, Desmond is a versatile sociologist, skilled at quantitative analysis, social theory, and the practice of ethnography. He considers these three methods equally important in influencing social-policy debates to acknowledge problems and move toward solutions. But his colleagues say his talent as a writer, above all, sets him apart. With a style that Eric Klinenberg, a sociologist at New York University, calls “deceptively simple but devastatingly sharp,” Desmond presents the poor in their full and complex humanity, with the hope that his words will motivate action or shift views. Desmond’s first book, On the Fireline, is an ethnography of wildland firefighters, a familiar population for him: an Arizona native, he spent three summers during college on a firefighting crew, then returned in 2003 to work a fourth season while conducting research for his master’s thesis in sociology. The book examines why men (the ranks of wildland firefighters are almost exclusively male) choose to enter such a risky profession, and how their upbringing socializes them to underestimate just how dangerous it is. The reader is a fly on the wall of the fire station, party to camaraderie and discipline as well as lewd talk and practical jokes. It seems natural that Desmond would gain the firefighters’ trust with relative ease; after all, he was one of them. But what about getting poor families in the inner city to open up to him, given the social and racial divisions in American society? Gaining entry requires a good dose of humility and a high tolerance for rejection, Desmond notes, but ethnography, he says, comes with far greater challenges, such as noticing the right things, knowing how to interpret what one sees, and remaining comfortable with confusion instead of rushing to impose order. During graduate school, Desmond and his wife, Tessa Lowinske Desmond (now program administrator and academic adviser for the Committee on Ethnicity, Migration, Rights at Harvard), lived in a low-income, predominantly black neighborhood in Madison, so “it was not a huge leap” for him to move into poor neighborhoods in Milwaukee for his fieldwork, he notes. Still, reminders that he was an outsider sometimes surfaced at unexpected moments, revealing how complicated and challenging it is to recognize and discard one’s own implicit biases. One New Year’s Eve, he was sharing a meal of chicken wings with fellow tenants at the rooming house. Without giving it a second thought, Desmond asked the woman who had prepared the food if she had a paper towel. The woman and her husband responded with friendly ridicule, remarking on the cost of paper towels and saying he should be content, as they were, to lick his fingers to clean them off. The skills that make a good ethnographer are not just different, “but opposite, and even antithetical,” to some of the other skills required of an academic, he notes. To do both, one must switch from being outgoing and gregarious to working in solitude; from listening and observing with an open mind to generating insightful conclusions in one’s own mind. Having “shed our scholarly skin,” he says, “we must climb back into it when the season for analysis and writing arrives.” But the insights generated through fieldwork make this awkward transition worthwhile. Desmond’s own college studies motivated him to confront poverty and racial injustice. The eldest of three children of a Christian preacher and prison chaplain father and a mother who worked with children with disabilities, he enrolled at Arizona State intending to study law. While majoring in communication and justice studies—an interdisciplinary program that combined history, sociology, political science, and law—he recalls that readings about poverty, inequality, and issues of race “blew my mind.” Determined to understand these problems more deeply, he set his sights on graduate school. At Harvard, he teaches a graduate course on ethnographic fieldwork and a junior social-studies tutorial, “The American Ghetto,” that guides undergraduates in conducting fieldwork in low-income Boston neighborhoods. He spent his first year and a half at Harvard as a Junior Fellow, working on his book about eviction and on The Racial Order, a volume written with Wisconsin sociologist Mustafa Emirbayer, Ph.D. ’89, his dissertation adviser, that aims to put forth a comprehensive theory for the field of race studies. Desmond notes that the book is used at a variety of institutions in all regions of the country, and beyond. He hopes that his work will ripple beyond academia to affect American society, in part by opening the minds of college students. Woo’s fortunes had been up and down since his days living with Desmond in the rooming house. Things had been going well—he’d been engaged to be married and had invited Desmond to serve as his best man—but then he was jailed for delinquent child-support payments, and his fiancée left him. Around the same time, he stepped on a nail; Woo thought the wound was healing, but diabetes had caused decreased sensation in the injured foot, and when he visited a doctor to get clearance to go back to work, he learned that the wound was so badly infected that his leg would need to be amputated. Desmond had visited a few weeks earlier, just after Woo’s surgery, bringing clothing and other items Woo needed and helping him reinstate his cell phone service. While conducting fieldwork, Desmond mostly resisted the urge to intervene. Still, with a deep level of involvement in people’s lives, “friendships are a natural result,” he says. Immersing oneself in a community leads to relationships and reciprocity. Desmond occasionally offered help, as any friend would; he notes that he was also the recipient of much generosity during his fieldwork in Milwaukee (especially remarkable considering the financial hardships affecting most of the people he met). As the sun began to set, Desmond sat on the cement outside the shelter, talking and laughing with his old friend. Woo would soon be fitted with a prosthesis, and was determined to walk again by Christmas. Next, he would confront the challenges of finding work and housing. For now, though, he had a bed in the shelter; many of the Milwaukee residents evicted that week would not be so fortunate. Contributing editor Elizabeth Gudrais ’01 is a freelance writer living in Madison, Wisconsin. Her last feature article profiled sociologist Bruce Western and his research on incarceration.